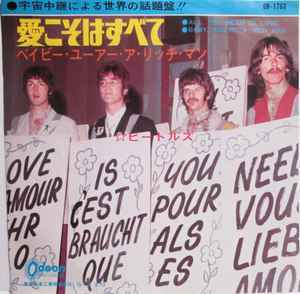 Japanese Odeon pressing with picture insert & lyrics/text in English & Japanese on reverse. This is the 1st pressing on red vinyl. A second pressing with same catalog number on black vinyl also exists. The words "Toshiba Musical Industries Ltd." and "G ¥370" were printed at the bottom of the lyric sheet and the words "MFD. BY TOSHIBA MUSICAL INDUSTRIES LTD. IN JAPAN" was printed at the perimeter.